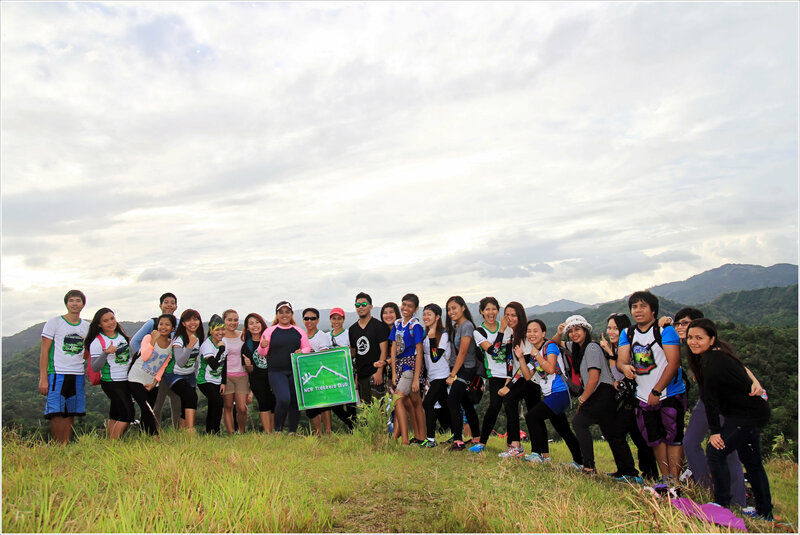 The second NCR Trekkers Club monthly climb was at Lanigid Hill. As planned, the first quarter climbs will be the easy ones, warm up climbs per se. 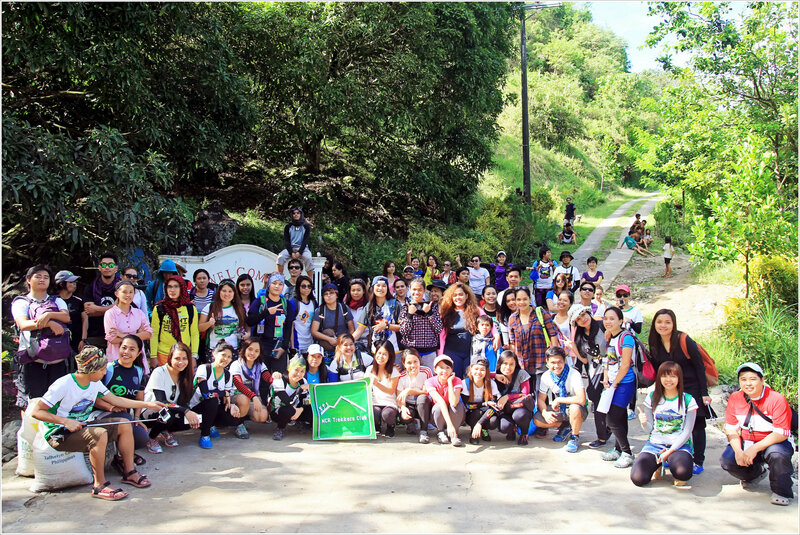 The hype of extending the outdoor experience to other individuals triggered the early invitation that was sent out as published in our January newsletter, not just only to the members of the trekkers club but to all NCR Employees – Cebu Office. The invitation has an overwhelming response with around 90 registrants after registration has been opened for a week. 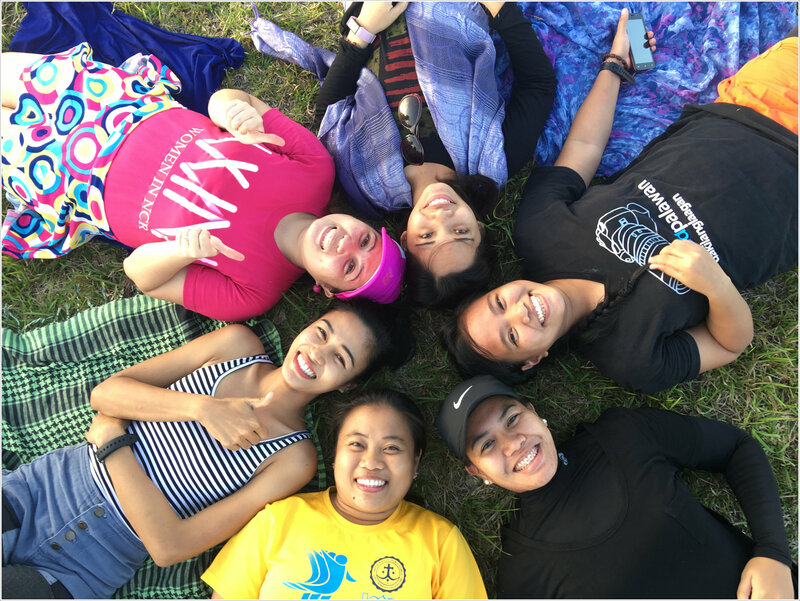 The club officers started to worry about the increasing number of registrants per day, not mainly because organizing large groups is a challenge but rather the major worry is about the size of the camp site. Lanigid Hill have just a small camping ground that are literally flat and we’re not really sure of its camp site capacity. Another worry was about the transportation going there, hired motorbikes (habal2x) can’t accommodate us all; of course with the number of registrants, it would take forever (I’m just exaggerating things here) to haul us to the jump off. Considering all those major factors, we decided to close the registration early to have ample time for planning, made the necessary preparations and devised contingency plans if the camp site and transportation were not feasible with the status quo. The registration was closed with a total of 92 registrants with guests as the majority (ironic right?). 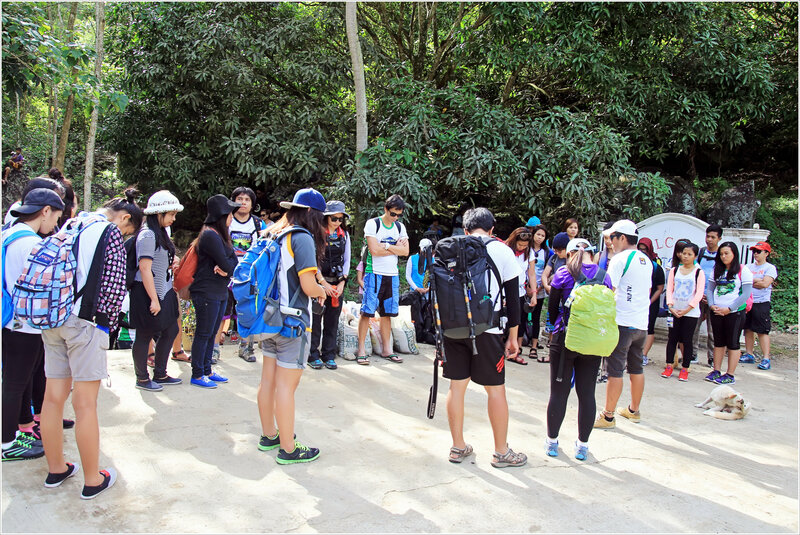 Pre-climb meeting has been called for the details of climb and divided the registrants into sub-groups with corresponding group leaders to make it more manageable in a small scale perspective. To make things certain and for the benefit of the doubt, we scouted the place few days before the trek just to make sure that the camp site is enough for all of us and to have a better alternative if things go sideways. 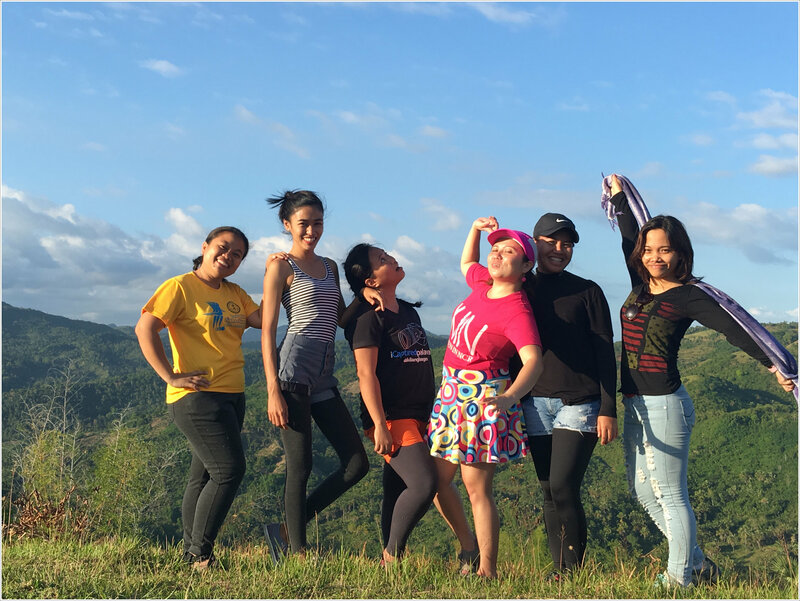 On the 24th day of Feb, Cebu Charter day (non working holiday in Cebu), we went to Lanigid Hill once again to scout the place. We found out that the peak has the space just enough to accommodate all of us. But since we don’t have the exact number of tents yet, we thought we needed an extra space as backup camp site rather an extension camp site. We found one but seems we don’t know who to ask permission with, since the place was located right next to the farm, few meters away from the peak. Luck was on our side, as the owner had paid a visit to her farm while we we’re under the mango trees taking pictures and playing around. We had ask the owner if we can use the space under those mango trees right next to the farm if all the campers won’t fit in the peak. Lucky enough, she willingly agreed to our request. The climb started with the meetup at Sungold right across SM City Cebu where our contact Jeepneys bound to Danao were waiting. There have been few setbacks as some members and guests were late from the meetup time. Misinformation on the itinerary and a slight haggling issues with the jeepney drivers for the fare were few of those. 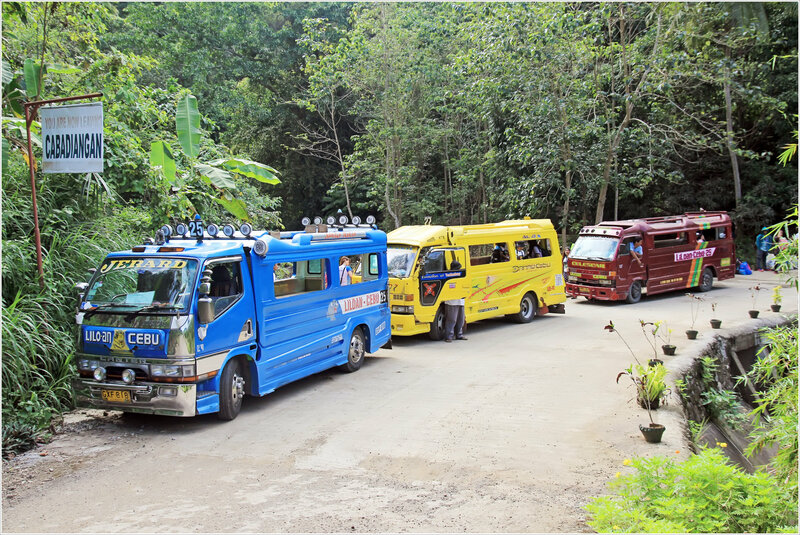 We hired three jeepneys for all of us. We stopped by at the Lilo-an Public market for lunch and picked up the other trekkers. After, we had lunch, ID distribution and heeded to Mulao after at around 2PM. We arrived at the Mulao sign an hour after. 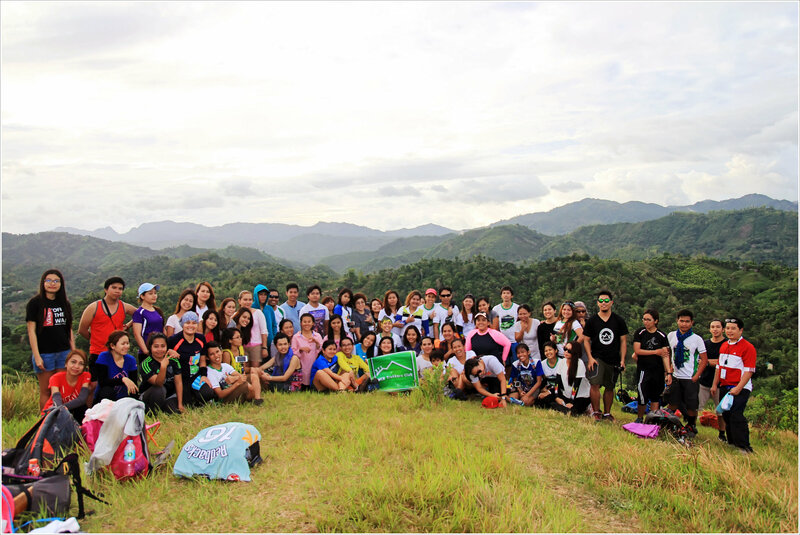 We had our prayer , stretching and picture taking before commencing our afternoon trek. Group picture at the Welcome to Mulao sign. Short prayer before starting the trek. Stretching led by Elijah and Pauline. 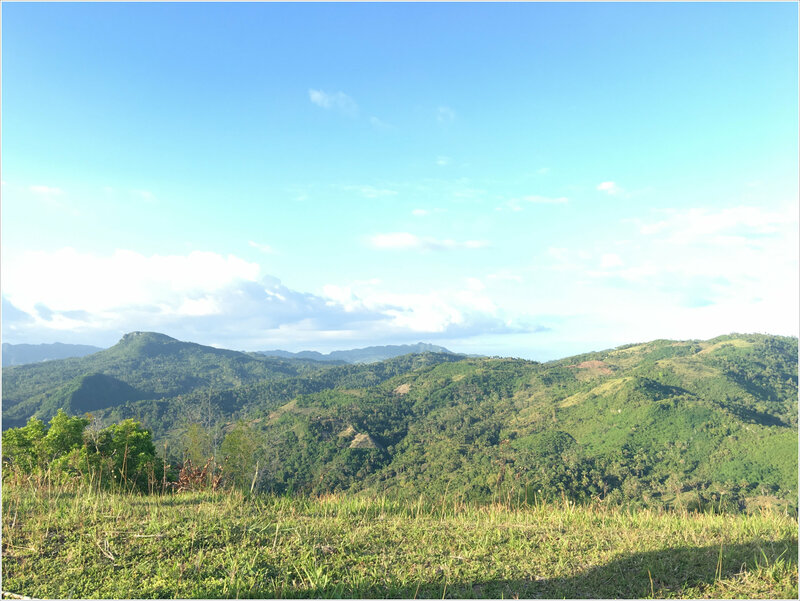 The trek was a bit tiring since the road going to barangay hall is a steep uphill climb until reaching the Elementary School at Mulao. I was leading the day trekkers on the ascent and not long after, the night campers followed. Just right below the peak , we had an unforgettable encounter with the heifer. She was furious and gone mad when we started to make our way up to the peak. It so happened that the heifer and her calf was pastured on the shoulder of the hill. 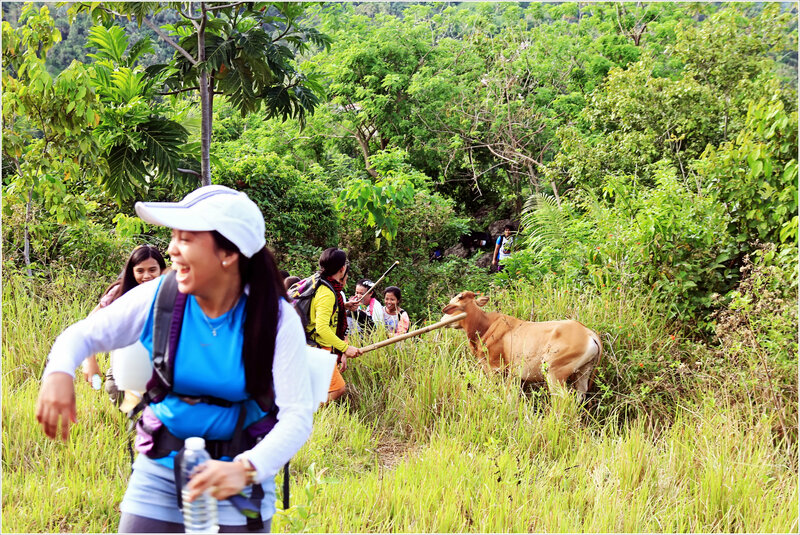 The angry heifer blocked the trail going uphill. 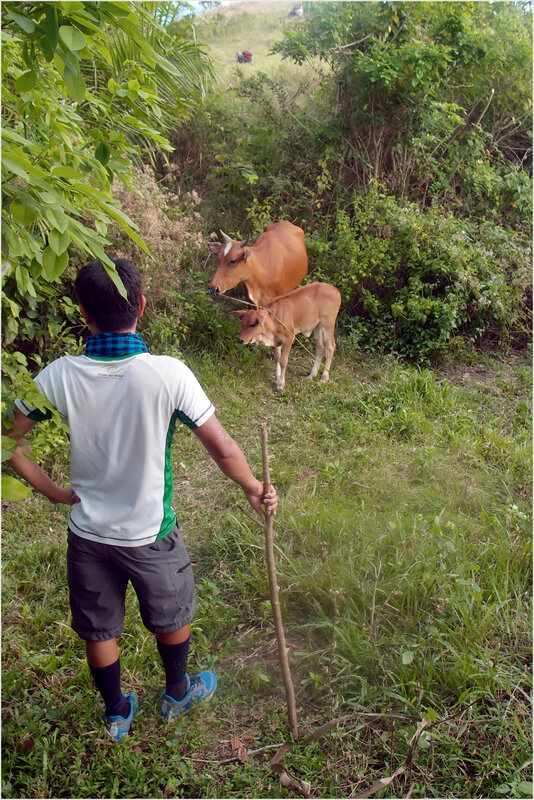 I managed to hold the rope of the heifer to make way for the trekkers, but when some of the trekkers started to frighten the calf, the heifer gone madly wild and I lost my hold of the rope that leads the heifer on an attack stance and chased the trekkers. 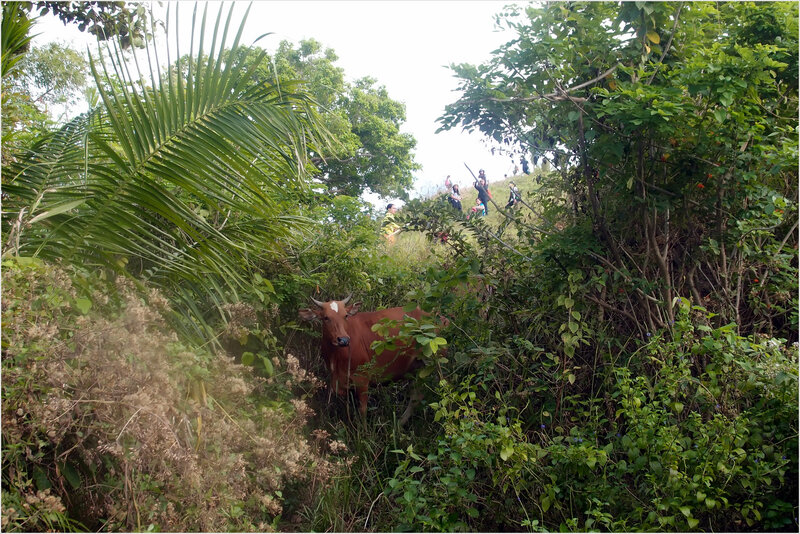 The trekkers right in front had managed to run quickly and the last one behind has nearly got hit by the heifer’s horn. Thank God it’s a heifer as the horn is just short, should it be a bull, the last one on the line would have been hit. I did not have enough strength to hold and control the heifer myself for all the trekkers to passed through. Thus I scouted another way going up. I found a trail that would lead to the peak and instructed the rest of the group to take the alternate trail and made sure everyone has passed the ferocious heifer safely. Despite the ferocious heifer encounter, all of us enjoyed the view at the peak. Most of us found relief and felt that the panoramic view on top is worth the effort going up and even more. Trekkers have taken pictures, have short chit chats with the new found friends. 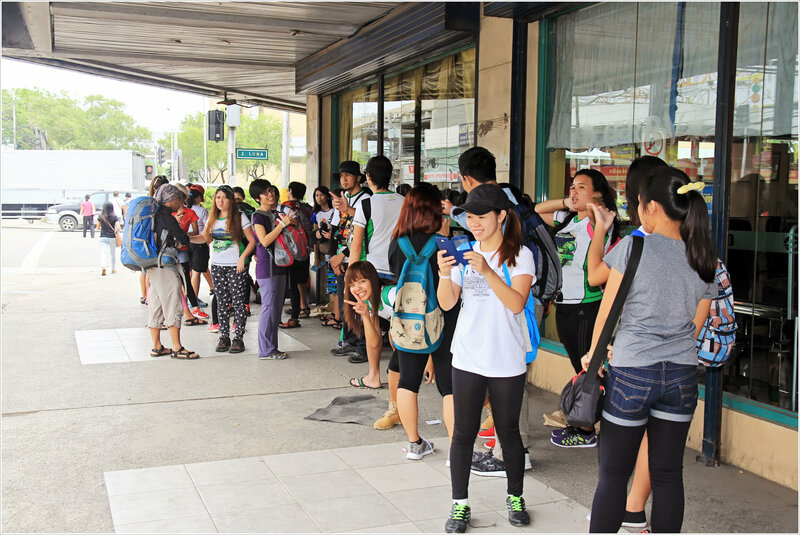 At around 5:30PM, the day trekkers started to descent back to barangay hall where one of the jeepneys had waited as their ride back to SM City Cebu. The Overnight campers started to setup the camp for the night and prepared dinner. Dinner was prepared per group and was served at around 7PM and we had socials right after. The usual socials included self introduction. Ask why we keep on having GTKY (Getting to know you) session during socials? It is because, every climb we have new guests and it is one way of getting to know more about them and to welcome them to the group. After the self introduction, each one was encouraged to share about their reasons for climbing and tell some stuffs they might want to share to the group or any hugot lines to break the ice especially to the new joiners and guests. Part 2 of the socials was the game session. 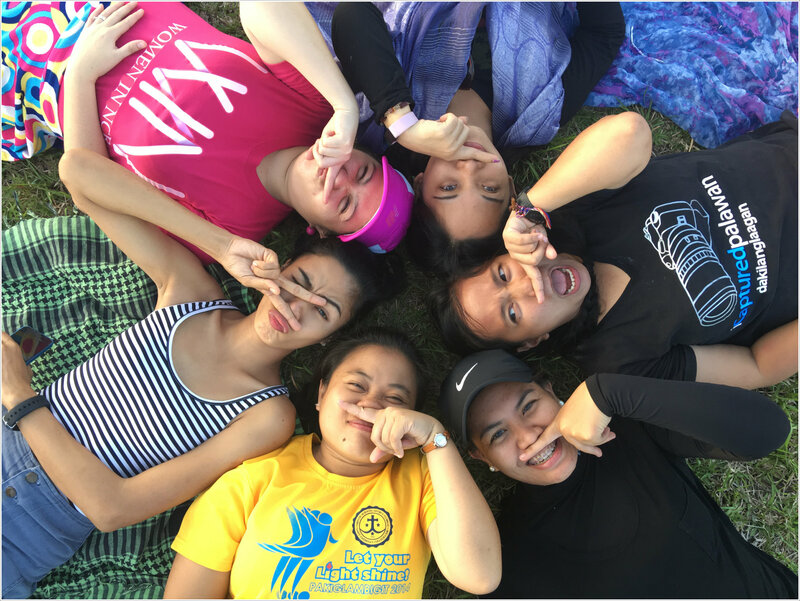 Kring and July introduced a new game craze – the werewolf game. I would not detail the game as you can look it up in the internet. This is a game of deception that requires strategy and deduction. It was really a fun game even if I did not join the game as I helped on providing light to the team – Yes I was the MERALCO at that time, este light bringer 🙂 . I really enjoyed the game and so the players. They were really into the game, they transformed into a totally different person. Some of them became more aggressive and some turned to a silent type. We even have the so called active villagers (Lanz and Dena). After the werewolf game, we had this another game called “trip around the world” riddle game wherein we have to guess the pattern in order to guess the correct place where to go next. The games went on from the world tour to Music Concert and wrapped up with “Pepe” game and the team decided to sleep past 1AM. Wake up call was 5AM. When I woke up at 5AM, I was amazed that most of the campers were awake already, staying right outside their tents, waiting for the sun to come out on those mountains from the east. Yes, not long enough the sun greeted us with a smile as he started to rise up. 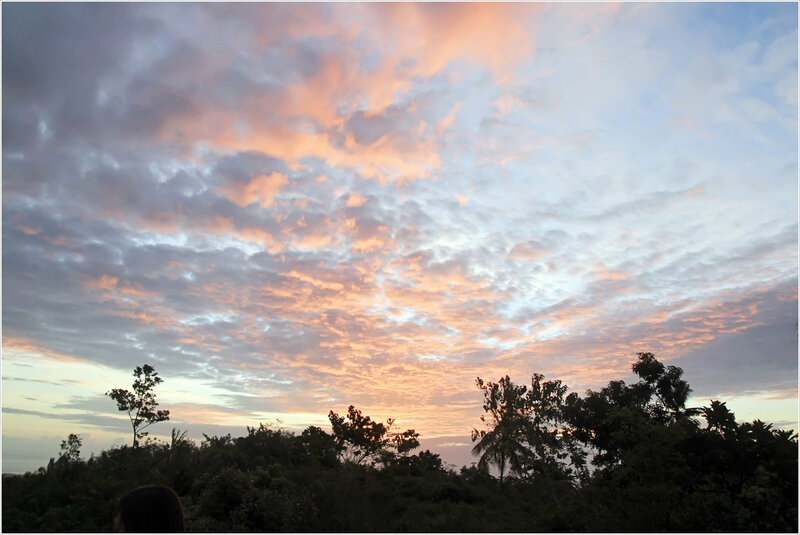 After watching the sunrise, we then prepared our breakfast, break camp, have few more pictures before starting the descent to barangay hall. We planned to have a side trip to Malingin River / Stone Ark but we don’t have enough time as our hired jeepneys were to fetch us back by 11AM. So we decided to stay at the covered court near the barangay hall and play werewolf once again while waiting for our rides back to SM City Cebu. 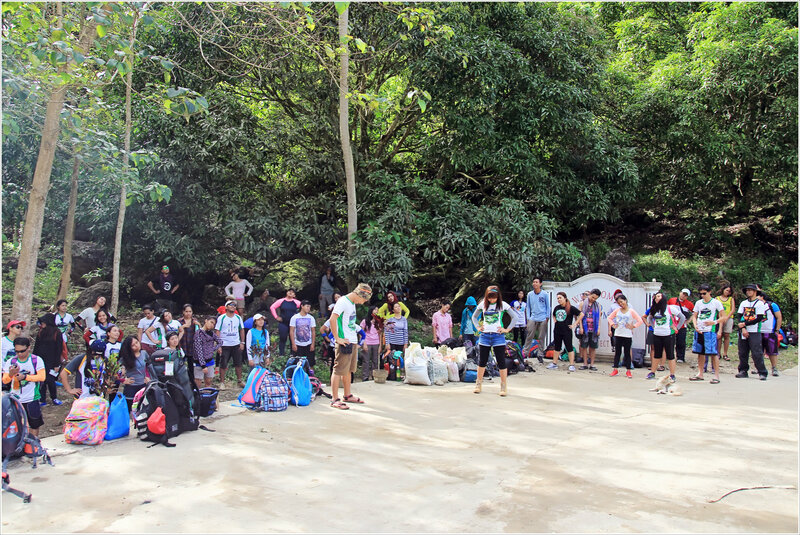 Overall, it was an amazing experience once again with the NCR Trekkers and guests.